Buying new automated industrial machinery is incredibly expensive. They’re tools that are intended to be the workhorses of a business that will use them day in and day out, and so they’re engineered to take abuse and last. But, old machines are usually dirt cheap, because they’re difficult to use with today’s computers and sometimes lack modern features. Sarah Spencer was able to take advantage of that to purchase two antique knitting machines at rock-bottom prices, and has hacked them to knit an amazing star map tapestry. Spencer picked up the first machine, an Empisal from the ’70s, for a mere $10 back in 2012. A year later, she purchased an ’80s Brother KM950i knitting machine. The Empisal is fairly basic when compared to modern knitting machines, and needs to be manually operated. The width of the piece and the color are preset, and the user slides a carriage back and forth until they’ve reached the desired length. The Brother is a bit more automated, and has an add-on motorized slide that helps with the manual labor. Getting those two machines working was already impressive, but Spencer didn’t stop there. She upgraded the Brother with a completely custom automatic color changer, which uses some sort of knitting magic to switch between yarn colors on the fly. That’s controlled over a network by a computer that can translate an image into a multi-color tapestry. At this year’s EMF Camp, she showcased her most ambitious tapestry to date: a huge 15 x 9 foot star map called Stargazing: A Knitted Tapestry. The tapestry looks absolutely amazing, and Spencer’s work proves that old machines can be hacked to be just as good as the new ones. 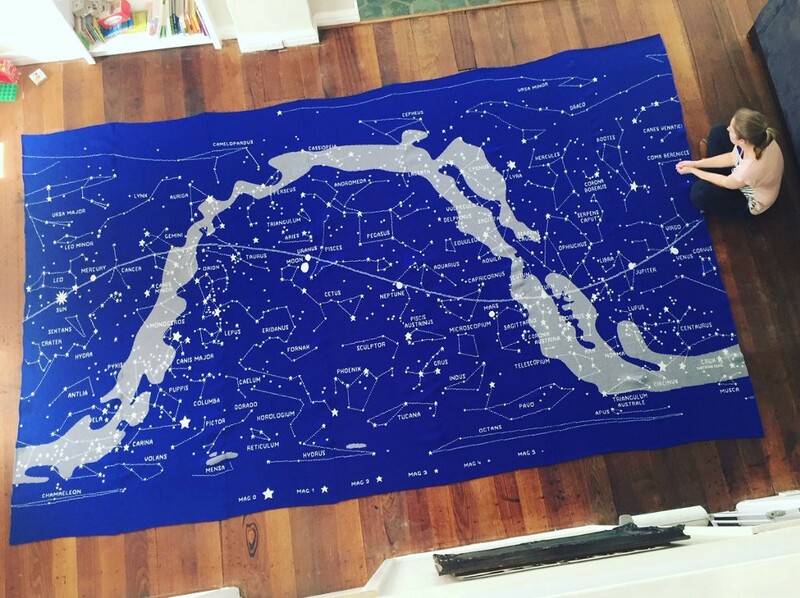 Old Knitting Machine Hacked to Weave a Stellar Tapestry of Constellations was originally published in Hackster Blog on Medium, where people are continuing the conversation by highlighting and responding to this story.